This banner helps me frame what I’ve been trying to say since Monday. 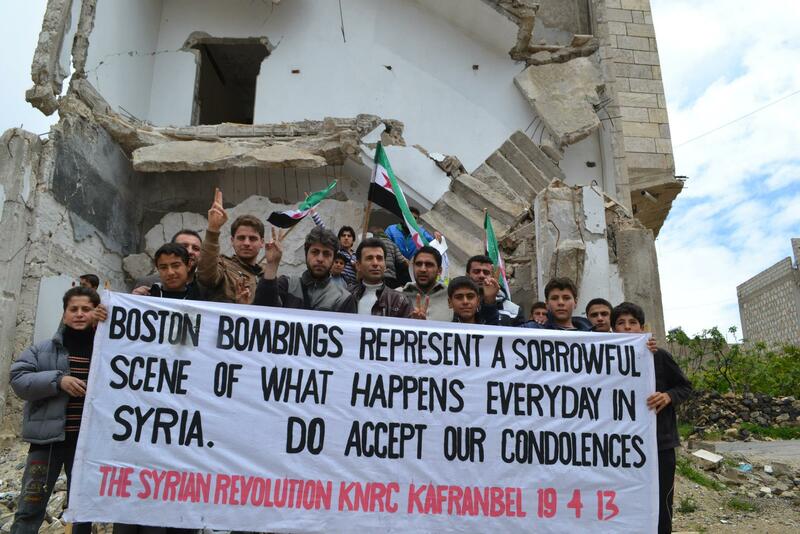 Syrian Revolution hold a banner in support of Boston. I don’t have compassion for the perpetrators of vile acts. My compassion extends to the victims of those acts and the environments in which both victims and perpetrators live. Given similar context, environment, and social structure, the only thing that separates a victim from a perpetrator is compassion: perpetrators do not have it. In other words, responding to an act of terror by saying “we must have compassion and understanding” for the perpetrator doesn’t cut it for me. I have compassion for the situations (Syria, for instance) and for people in general (perhaps those holding the banner), but I will not waste my compassion on those who would turn their own victimization into an act of destruction. Why? Because out of the millions and millions of victims on this planet, only the most cowardly seek to perpetrate their problems on others. I will not waste my compassion on current psychopaths, rather I will use my compassion and empathy to prevent societies from creating them in the future.